Picker Eater - 7 Tips to Stop Mealtime Battles and Enjoy Dinner Again! When you were pregnant with your first child you dreamed of the sort of child your baby would become. But I can guarantee that you never dreamed that your child would be a picky eater! Every parent has the best of intentions when it comes to their child and their eating habits, but good intentions don’t always work. I have 3 kids born within 4 years of each other, my eldest two are excellent eaters and will try anything (their favorite food is sushi!). But my youngest? Not so much! Child #3 is very strong-willed and stubborn (no idea where he gets it from…). If I try to force him to eat something he doesn’t like the look of, he is even MORE likely to push it away. But I know there is hope. My daughter (child #2) was the WORST picky eater you have ever met! Yogurt, mac & cheese and crackers were all she would eat. No, seriously – that was it! When she was 7 years old we went on a trip to England to visit my family and it was such a painful experience! She basically didn’t eat because it wasn’t her normal brand of crackers, mac & cheese or yogurt! Let’s just say, it was a long two weeks. But now? Now she will try anything! Sushi, goats cheese, hummus and anything with garlic are among her favorites! OK, there are still foods she doesn’t like, but at least she will try something new. Armed with the knowledge that children’s appetites change, I don’t worry too much about my youngest and his eating habits (and he eats more than my daughter did anyway). Over the years I’ve picked up a few tricks for dealing with picky eaters and I thought I would share them with you. Below are my 7 top tips for getting your picky eater to try new foods! There has been a lot of research into children’s eating habits and it seems that there is a purpose behind their picky eating. It is now believed that there is an evolutionary advantage to being a picky eater when you are young. Before the age of 2 years old, children tend to put EVERYTHING in their mouths. This is one of their ways of exploring the world around them. But once that child is a toddler and has a little more freedom it can become dangerous for them to eat anything they find (mom or dad aren’t always nearby to see). There are many many cases of accidental poisoning each year from young children eating things they shouldn’t. By being a picky eater your child is less likely to try new (and sometimes dangerous or poisonous) things and therefore has an evolutionary advantage over toddlers that continue to put anything and everything into their mouths. So when your child is refusing to try a new food, it isn’t always because they are being stubborn. Their brain is hardwired to avoid new and unfamiliar foods. Of course, that doesn’t mean that we give up completely! We just have to find works to work WITH our child’s biology, rather than against it. If a child is involved in the planning and preparing of a meal, then they are more likely to try it. Even if they just help you make dessert, it’s a good way to get them involved and help start a conversation about new foods. I love making Caramel Chocolate Rice Crispy Treats with my kids as they can help with all the steps. If I want to get my little one to try something new, I start at the grocery store. I might get my youngest to help me pick out which kind of tomato we will use for dinner that night for example. Most grocery stores have wonderful displays of fruits and veggies – use these to your advantage! When your child sees a beautifully stacked pile of shiny apples, they might show more interest in trying it than if it’s just cut up and appears on their plate. Once they’ve helped you pick out the ingredients then it’s time to start cooking. There’s plenty of simple activities that a child (depending on their age) can do on their own. Stirring, pouring, mixing etc. Even if it’s a task that’s not suitable for a little one, I still have them standing near me and talk them through what I’m doing. It’s also a good time to encourage them to try a bite of something as they are cooking with it. A quick lick of a spoon is sometimes all that is needed to change their mind about a food. Once dinner is ready and it’s time to serve it to the rest of the family, I always make a big fuss over the “chef”! I’ll explain to everyone else that “Billy worked very hard to prepare a yummy dinner for us all and we should say thank you to him”. By instilling a sense of pride in their meal, then they are more likely to try it. There are dozens and dozens of cookbook available with ideas for recipes that kids can help with. I LOVE the Kid Chef book as it has great recipes and instructions to really get kids interested in cooking (some of the recipes my daughter will cook on her own – perfect for busy evenings, so she can cook while I do chores!). Children love predictable routines. Their little lives are often way out of their control and as they get older they long for control and stability. By making sure that you eat at a consistent time every day, it will help your child anticipate when their mealtime will be. It also means that if dinner is at 6 pm every night, you know that you need to cut off the snacks from 4 pm, so your child is hungry at dinner time – a child who isn’t hungry is unlikely to try a new food! I understand that it’s sometimes hard to keep a consistent routine, especially if your children are involved in a lot of sports or activities. But try to stick to a set schedule as much as you can – it will help your picky eater feel more in control. I find that being consistent about WHERE we eat helps them too. We always eat at the kitchen table and we all sit in the same seats every night. That way there is no conflict or confusion before dinner has even started. I’ve also found that with my son, he likes to always use the same plate (this dinosaur one). I’m not too sure why – again, I think it’s a control thing. It means he has a little bit of control over his meal time. He also likes that the plate is divided, so the “yucky” foods don’t touch his favorite foods! Kids love to have fun! OK, you probably already knew this! But it’s something important to remember at mealtimes as well. I’m not saying you have to be a hibachi chef and put on a show for your kids (although even my pickiest eater loves hibachi! ), but you do want to add some fun to the proceedings. We love to eat as a family around the table together. For a while, after we moved house we couldn’t get to our table (moving boxes! ), so ended up eating on the sofa, and of course, the TV would then be turned on. I found that we would just ignore each other and didn’t have fun or get a chance to chat. Once I realized this I made it a priority to clear off the table, so we could all eat together again! We tell jokes, funny stories or just talk about our day. We LOVE these fun Melisa and Doug Conversation Starter Cards. There’s 84 of them in total and it’s so much fun to read 2 or 3 of them at dinner time and then talk about our answers! One of my favorites is “If you could have a wild animal as a pet, what would it be?” I love my children’s answers to that one! If your child is bored, then they are more likely to want to finish their meal quickly and leave the table to go and do something more interesting. Keep their attention and they will stay at the table longer and more likely to try some more of their food. You can also make the food more fun too! I’m not talking about going to the extent of making their dinner look like a sailboat (although that’s fun too! ), but just giving the food a silly name or arranging things in a fun way can help. 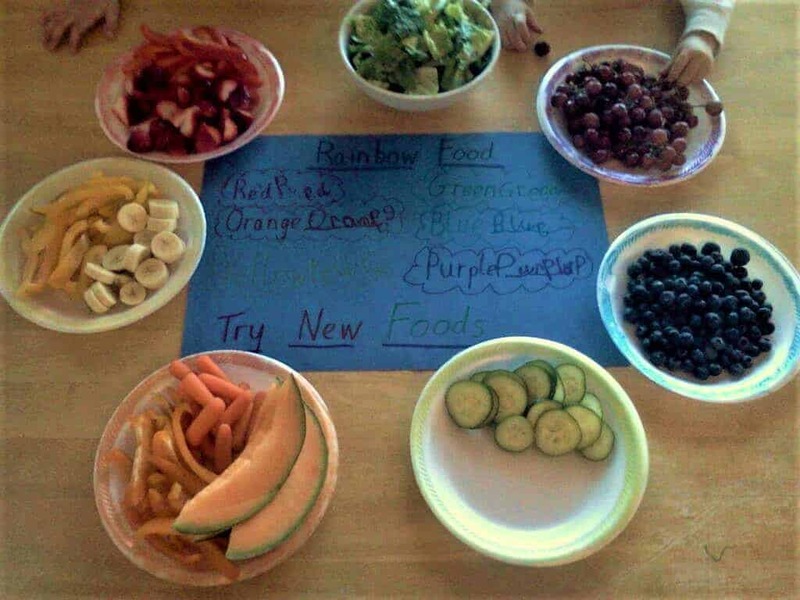 We once had a lunch where we “ate the rainbow“! We went shopping together and bought foods for every color of the rainbow. The only rule was that they had to try a food from each color! I also use TV and movie characters to help “sell” a new food to my little one! My youngest son LOVES Teen Titans Go, so we watched the episode about avocados and then had guacamole for dinner that night! And yes…. he ate it all up! In fact, he loved it so much he asked if he could take guacamole to school instead of cupcakes for his birthday! That was a HUGE parenting win for me! When you have a picky eater it can be really discouraging to make a wonderful dinner and then they push their plate away and not eat it. I’ve already talked about the evolutionary aspect of picky eaters (unfamiliar foods could be poisonous) so you need to work with their biology, instead of against it. I try to always serve something familiar with every new meal (even for my older, non-picky, kids). That way at least I know that there is always something they will eat. This was much harder when my daughter was little as she literally only liked yogurt, mac & cheese and crackers. So most of her meals had a handful of crackers on the side. My son likes a few more things, so I can make sure there is a side of pasta, rice or applesauce for him. Of course, if you are putting something they don’t like or new on their plate, there is the risk of it touching their familiar food and then they refuse to eat that too! That’s another reason I like to use a divided plate for my son. That way I don’t have to worry about the “but they are touching” argument! If my son starts to fuss and whine about the dinner, then I just point out the food that he does like and encourage him to eat that. Often once he is calmer and starts eating he will continue eating everything else on his plate too! If a child is upset or angry then there is no way they are going to try something new! A calm child is much more open to suggestion! This is a common piece of advice, but it’s also very true. You sometimes have to present your child with a food many, many, many times before they will try it (or like it). This also has roots in the theory that children avoid unknown foods because their brain is wired to be cautious of the unknown. By giving your child the same (disliked) food, again and again, it slowly becomes a familiar food and they are more likely to try it. I know this is one of the most frustrating pieces of advice, but it really does work…. it just takes time! This is probably the single MOST IMPORTANT piece of advice if you want to avoid mealtime battles. It’s very tempting to make threats and force your child to eat all their dinner, but this is the worse thing you can do. Firstly, you are just creating conflict by forcing your child to try something or eat something they don’t want to. You might think it’s illogical for them not to want to try it, but it’s all about control. By forcing them to eat it, you are making the battle for control even worse. You also never want to force your child to eat everything on their plate. The number of times as I child I was told: “you can’t leave the table until you’ve eaten everything”. All this did was teach me to ignore my body’s fullness signals and keep eating. It’s no secret that there is an obesity problem in America and one of the causes is that people ignore their bodies when they are full. The last thing you want to do is force your child to keep eating when they are full. Of course, children will try to use the “I’m full” excuse to leave the table to go and play or to do something else. The first few times this happens you have to let them go, but if they complain of being hungry later, then you have to point out that they left half their dinner and maybe next time they should finish it, so they won’t be hungry later. I know you think this doesn’t “solve” the picky eating problem, and you’re right, it doesn’t solve it that day. But it will solve it in the long run. By giving your child choices, freedom and control of their meals they no longer use mealtime as a chance to stretch their independence muscle! If you don’t make meals into battles, then they will have no reason to fight against you. Over time, if you use the tips above, your child will start trying more and more new foods. The change isn’t instant, but it does happen! In the space of a year, my daughter went from eating just 3 foods to trying (and liking!) almost everything! I hope you find these tips useful. They are based on my own experience and years of helping family and friends with their picky eaters too! What ways have you found to help your picky eater? I’d love to hear your advice – please share in the comments below.